It’s often said that a cookbook is worth its purchase price even if you only make a few recipes out of it. I’ve had the River Café Two Easy book for years but have never really been excited about most of the recipes in it — except this one. 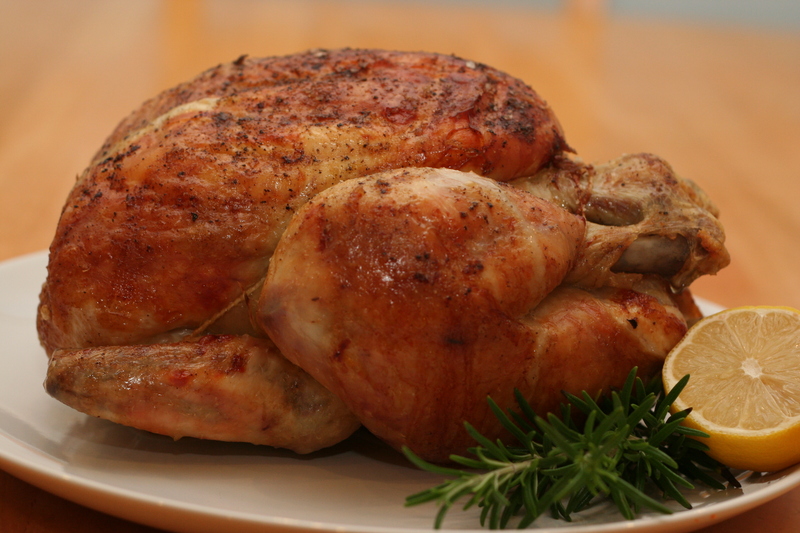 This is a roast chicken worth writing home about. You roast it at a very low temperature for three hours, flipping it over once an hour, then jack up the heat for the final 30 minutes to crisp the skin to a picture‐perfect golden brown. The chicken is unbelievably moist — roasting it at such a low temperature makes it almost impossible to dry out — and the flavors of the lemon, garlic and rosemary in the cavity really penetrate into the meat. If you know you’ll be home all afternoon, there is no better dinner to make, as you can bask in the amazing aromas that will drift out from your kitchen for hours. Once you make this, I’m willing to bet that, like me, you won’t want to roast a chicken any other way again. The tang of the crème fraîche in the mashed potatoes is a good match for the lemon and vermouth in the chicken. Depending on what time of year it is, I like to also serve this with simple sauteed carrots or green beans dressed with lemon and olive oil. *Feel free to omit the alcohol altogether. It won’t really affect the flavor of the chicken, just the juices. Preheat the oven to 175°F (80°C) and wipe the chicken clean. Cut the lemon in half. Rub one half of the lemon all over the chicken, getting as much juice onto the skin as you can. Season the cavity with salt and pepper. Peel the garlic, wash the rosemary and stuff it into the chicken, along with both lemon halves. Place the chicken upside down in a roasting tin just large enough to hold it. Add the water. Cook for 1 hour, then turn right side up (I can usually just do this with my bare hands since the roasting temperature is so low). Return it to the oven and cook for another hour, then turn upside down again and cook for yet another hour. Remove the chicken from the oven and raise the temperature to 400°F (200°C). Brush the melted butter all over the skin, season very well with sea salt and freshly ground black pepper, and add the vermouth to the pan. Return the chicken to the oven (make sure it finishes right side up) and cook for 30 minutes, until golden brown and the juices run clear. Strain the fat and serve with the lemony, salty juices from the pan.